Brighton returned to winning ways with a 1-0 victory against Watford this afternoon. Here's six things we learned from the game. Albion sit 12th in the Premier League at the halfway stage of the season with 21 points from 19 games. For a newly promoted club, it's been an excellent start to life in the top flight and the Seagulls will now be hoping to continue the momentum throughout the rest of the festive period. They travel to Chelsea on Boxing Day, before a trip to Newcastle on December 30 and home clash with Bournemouth on New Year's Day. Arch rivals Crystal Palace briefly moved above Brighton in the as-you-stand Premier League table when they took the lead at Swansea on 59 minutes. Albion went ahead through Pascal Gross five minutes later and Palace were unable to hold on for all three points at the Liberty Stadium, so Brighton now sit three points ahead of the 16th-placed Eagles with a superior goal difference. At half-time, Mariah Carey's hit single 'All I want For Christmas Is You' played over the Amex speakers but Albion fans would have been forgiven for changing the lyrics to 'All I want for Christmas is a goal'. The Seagulls had scored just once in six games going into the match and that was a penalty in the 5-1 defeat to Liverpool. However, 19 minutes into the second half Pascal Gross cut in from the left and drilled home a low shot under Watford keeper Heurelho Gomes, who got a hand to the ball and probably should have kept it out. Gross was a key figure in Albion's strong start to the season but had a quiet few weeks until today. His goals and assists will be crucial to the Seagulls again in the second half of the season. Albion went into the game with just three points - all draws - from seven games, while Watford had collected just one point in their previous five matches. 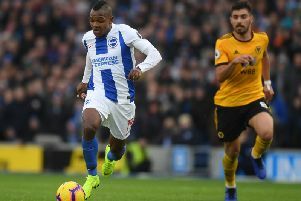 It was viewed as an ideal opportunity for Brighton to return to winning ways as Watford had three players - Troy Deeney, Marvin Zeegelaar and Abdoulaye Doucouré - suspended and a host of injury problems. For Albion, Shane Duffy missed out after collecting his fifth booking of the season in the 0-0 draw with Burnley last week, which meant Connor Goldson came in to make his Premier League debut. Pascal Gross' goal won it for the Seagulls, although Watford may still be wondering how substitute Stefano Okaka failed to turn the ball home from close range after Albion keeper Mathew Ryan spilled a cross deep in injury-time. Just ten months ago, Albion defender Connor Goldson feared he may never play again after being diagnosed with a heart issue. The 25-year-old had preventative surgery and now has a scar running down his chest but Goldson will remember today for the rest of his football career. He made his Premier League debut and just third appearance of the season. Seagulls boss Chris Hughton admitted Goldson was down after a loan move to Ipswich didn't materalise on transfer deadline day. He could well head out on loan come January and there's sure to be a host of clubs interested after a man-of-the-match display today. Albion fans sang their song for the popular defender before the game and his first clearance was met with a huge cheer from the Seagulls supporters, who now how hard Goldson worked to return to action. Albion winger Anthony Knockaert was booed constantly by Watford supporters and it seemed to fire up the wideman, who perhaps tried too hard in the first half. Knockaert famously missed a penalty when the Hornets beat Leicester in the Championship play-off semi-finals in 2013 and was the victim of a horror Miguel Britos tackle, for which the defender saw red, in the 0-0 draw between the sides earlier this season. Knockaert looked to run at the Watford defence whenever possible in the first half but lost possession too easily on a couple of occasions - possibly because he was trying too hard to make an impact in front of the Watford fans in the South Stand. He could have scored in the second half and was constantly involved in the action. Watford winger Richarlison rolled around on the floor for a good minute after being challenged by Albion captain Bruno in the first half. While it was a foul, Richarlison certainly made the most of the incident, clutching his leg, then looking up - on repeat - until his team mates kicked the ball out of play. As soon as that happened, a promising Watford break was halted and Richarlison got back up to his feet without needing treatment. Quite why players do that - and end up costing their own team momentum - is a mystery, especially when there's little wrong with them. Bruno received a talking-to from referee Paul Tierney for the challenge but that was it. Brazilian winger Richarlison has been in sparkling form for Watford this season but his day did not get much better today as he headed wide an outstanding opportunity to put the visitors ahead early in the second half.